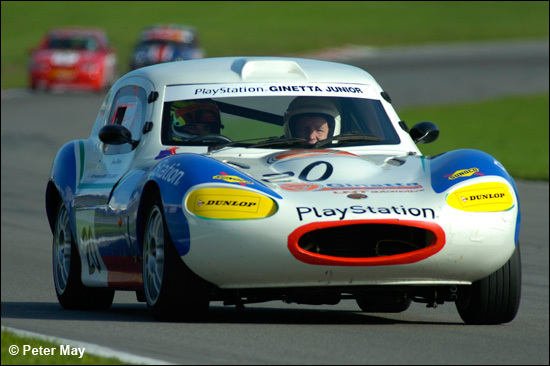 Richard Dean, Tom Kimber-Smith and ‘Mr Ginetta’, Martin Phaff, were present to show off the Ginetta offerings of LNT Automotive to aspiring 2007 competitors. There was also plenty of Panoz news... to come. TK-S was out in the first session in the ‘baby’ Ginetta with his better half - “showing her a good time!” We’ll draw a veil over that one, but suffice to say that his young lady emerged from the little Ginetta Junior looking flushed and mighty impressed! 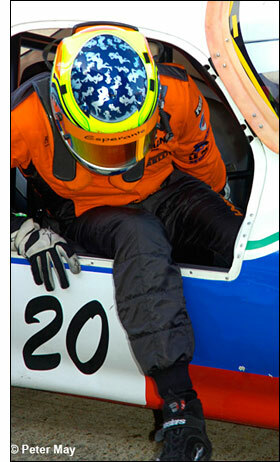 Then it was time to climb aboard the Ginetta (and out of it again, right! ), still in the capable hands of T K-S for a few quick laps. Despite having just a 1400cc, 105bhp Ford Zetec engine up front the little coupe version of the Ginetta G20 is surprisingly nippy, weighing just 630 kg. Better still its handling feels absolutely superb: Paddock Hill Bend was taken unfeasibly quickly with Kimber-Smith really chucking the little car around. More rapid progress was stopped only by a lack of straight line grunt, a clutch that was beginning to cry ‘enough!” and the rather mixed abilities on display elsewhere on track, in everything from an elderly MG Metro up to a Radical SR8. Aside from that though it was an excellent display of what a light, well-sorted little car can do in the hands of an expert: very impressive indeed. Back in the pitlane Richard Dean was dropping some hints on plans for 2007. But Team LNT has a trio of Panoz Esperante GTLMs. What of the third car? 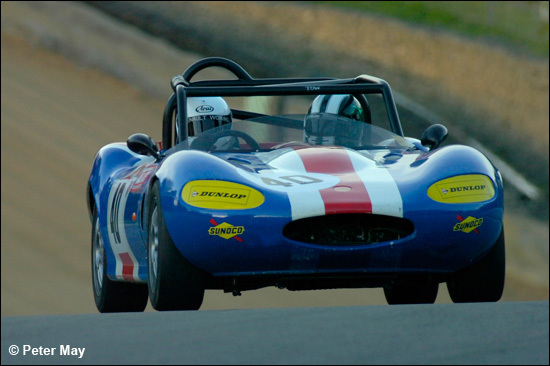 LNT is also the European distributor for the Esperante and the trip to Magny-Cours for the team was touted as an opportunity to show off the cars to prospective customers. An official announcement (or announcements) will be with us soon, but for now it’s fair to say that the Le Mans Series in 2007 looks set to include more than just LNT’s two Panoz! 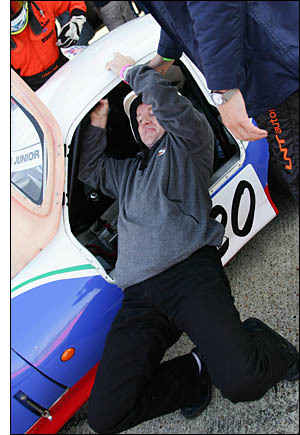 And this man, Tom Kimber-Smith, right, clambering out of the Ginetta, should have anther fabulous season ahead of him. The team’s full 2007 programme and driver line-up looks set to be announced at the Racing Car Show at Birmingham’s NEC, where LNT is due to have a major presence, with the Ginetta Challenge, Playstation Junior Championship and Team LNT Panoz, the latter due to be on the stand ahead of the European launch of the right hand drive Esperante road cars. 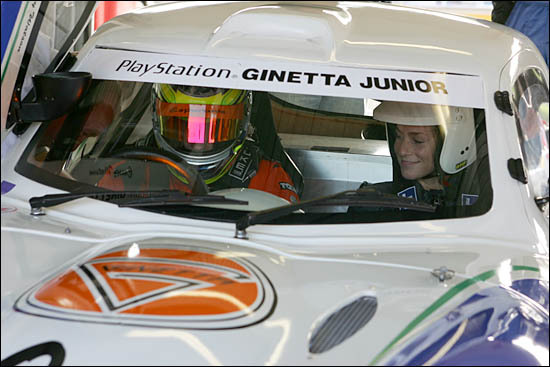 In the meantime any mums and dads of 14-16 year old budding Kimber-Smiths might want to drop Ginetta a line at martin@ginettacars.com to get more details of the Junior Championship for 2007.